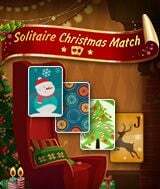 Download Solitaire Christmas Match 2 Cards for free at FreeRide Games! Solitaire Christmas Match 2 Cards is a holiday card game filled with the joyful spirit of the holidays. 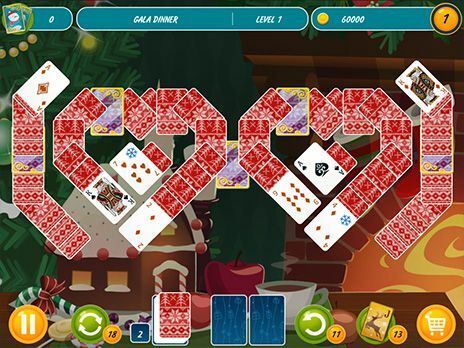 The anticipation of Christmas miracles and 120 unique levels form a winning combination for fans of classic solitaire! Solitaire Christmas Match 2 Cards is a fun new twist on traditional solitaire for players who love to try new types of deals! Find and match any 2 cards quickly to increase your winnings! Buy bonuses using the following coins: shuffle, undo last move, and joker. Choose your difficulty level, and maybe even go for Professional, but be warned: this is only for true lovers of solitaire! Let the relaxing music and premium graphics take you away into the wonderful atmosphere of the holidays. Match 2 Cards in 120 unique levels! Entertaining gameplay - choosing pairs of cards! Use different bonuses - mulligan, shuffle, joker!